If you manage the production of technical documentation, translations for different markets are probably part of your remit. Here at Comtec we work with documentation and content managers across a wide range of different industries, who all share common requirements when it comes to commissioning technical translations. We understand the importance of translating large volumes of content quickly and accurately whilst driving down costs as much as possible. Fortunately this is achievable when you engage a translation provider long term. If you have on-going translation requirements, for example new product launches and updates to existing manuals, the processes a translation partner will put in place help to deliver cost savings and speedy turnaround times at the same time as ensuring content is translated to a high-standard. Process is everything with technical translations. That’s why it’s really important when benchmarking different providers to understand what their processes are, and also what technology they use to enhance these processes. The following points will help you identify the right translation service provider for your technical translation needs. Technical documentation often involves large volumes of content and industry-specific terminology. Incorrect translations can have serious legal and health & safety implications, which is why they need to be handled by experienced translators. Always use a professional Language Service Provider that has extensive experience delivering technical translation in your industry. One who will build a team of expert translators with industry specific expertise to work on all your technical documents. Select a translation provider who has quality assurance processes in place to ensure that translations are delivered to the highest possible standards. Look out for ISO 9001:2015 and ISO 17100:2015, two certifications that Comtec holds, as these quality standards ensure that translation excellence is maintained in all key processes and procedures. Translation providers may complete sample translations so that you can approve specific terms and style. As translations are completed, glossaries of terminology should be created to ensure high quality and consistent translations across all your global documentation. 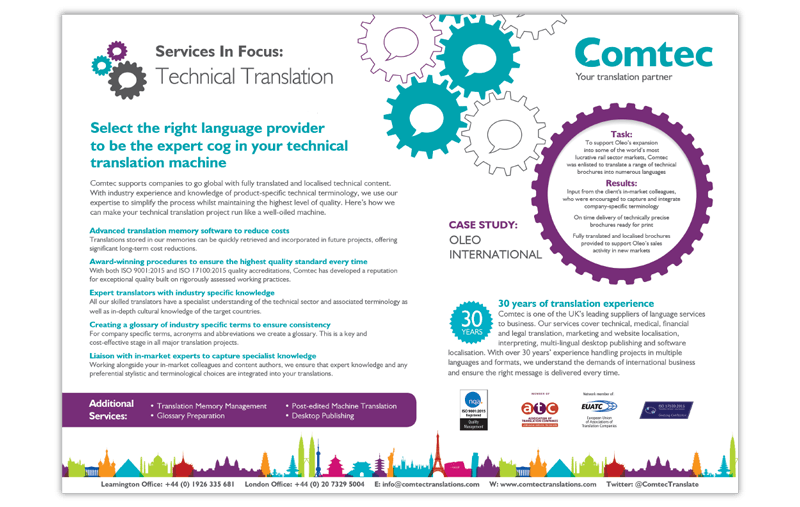 Language Service Providers like Comtec advise clients on processes they can adopt to streamline the technical translation process, particularly for the in-market review and feedback stages. A great translation provider is prepared to tailor their processes to your needs, reducing your workload and integrating their services with your processes. Ask translation providers about their project management team to get an understanding of how extensive their project management capability is, and how much you can delegate to them. Ideally, with robust project management and clear processes in place, your Language Service Provider will look after the hard part whilst you simply send over the source content and sign off translated content. It can be expensive to translate large volumes of content such as product manuals, since translation costs are typically based on word counts. Technical translation providers will help you reduce these costs by using technology like Translation Memories. These store key terms and phrases in each target language. Any new content can be analysed against Translation Memories in order to identify any previously translated phrases. This effectively reduces the word count and project costs by removing the need to re-translate terms. Other types of technology can also be used to streamline processes and provide clients with a complete overview of their translation project. We’re currently developing a new API that will integrate our clients’ systems with Dovetail (our translation management platform): expect your translation partner to be investing in this type of technology as it delivers real value to clients. The points above will help you assess whether a translation service provider is process driven and has the systems and technology in place to meet your technical translation requirements. Please get in touch if you have any questions about the subjects covered in this post or want to learn about the technical translation process. 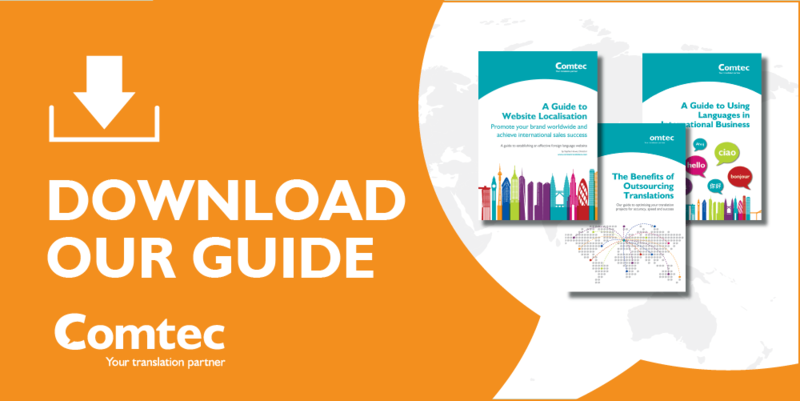 We have also produced a guide to technical translations that provides further insight into how Comtec ensure accurate and consistent translations. Download your free copy here.